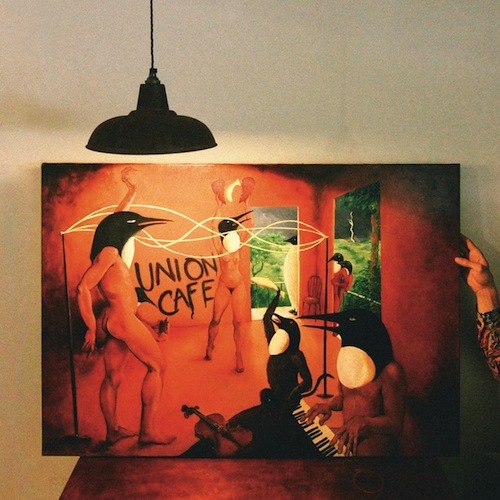 When I first heard of Penguin Café Orchestra, I was struck with a particular nostalgia for the time when I first began trying to dig around for my music. One method of discovery that came to mind were when one would go onto a forum or a board where people posted download links for all the obscurities they could think of – albums which eluded the denizens of Discogs, slipped unnoticed past Wikipedia’s eye, ending up contained within a MediaFire URL, simply labelled by name, date, and broad genre terms, a veritable mystery box waiting to be torn open. Yet, in having such a memory provoked by Union Café, I betrayed a slight cynicism. Described as not exactly having one neat genre, a strange cover art with a seemingly intentional lack of finesse, a frontman that died much before their time and a name that for all I know could be ironic, it felt like something I had read many times before, as if I was going to hear a nice post-punk record. Instead, I discovered that the band really were an orchestra, relying on orchestral instruments to achieve their sonic goals. Simon Jeffes created the project in 1972 when a dream that came in a time of illness struck him: a hotel wherein the occupants live life in dull, isolated, emotionless desolation. All is quiet, all is grey. Once he recovered, another vision struck: The Penguin Café. A place where spontaneity thrived, where the orchestra played all day, where “your unconscious can just be”. Within these two dreams lies Jeffes’ dissatisfaction with the structures and rule sets which demanded that he take influence from someone like Karlheinz Stockhausen, who never could touch him as directly as a Mbira player from Zimbabwe could. Liberation from these structures is present within the music, becoming clearer as more and more little details that do not seem to fit into the definition of ‘classical’ come to the forefront. The strings layer beautifully, crying out on tracks like ‘Lie Back and Think of England’; a song like ‘Vega’ will feature a simple piano at its core, acting as foundation for all that occurs above it. Instruments will truly contrast with and complete one another, as if they could not fully accomplish what they are doing if even one participant was to be removed. Conventionally classical, specifically romantic-era and perhaps even folk in jauntier-sounding tunes like ‘Scherzo and Trio’ and ‘Organum’, we pass through on the appropriately-named ‘Passing Through’. There is more, though. As alluded to before, what influences this album is ‘world music’, or more truthfully, non-European music. Here in Union Café, the use of instruments from many ends of the globe accomplishes what the likes of Paul Simon and The Beatles failed to. Whenever I hear Arabic rhythms or other such distinctive sounds on tracks like ‘Another One From Porlock’, I waited for a disappointing transition to ethnic cosplay that never came; rather, the instruments remained focused on the record itself. Throughout listening to this album, though, I thought of several experimentations as being a bit modern in a way that didn’t seem to wholly fit. This, which would nag at me throughout, finally confirmed itself with the delightfully novel track ‘Pythagoras On The Line’, wherein the instruments play along with the dialling and beeping sounds of a house phone. The spontaneity that appeared in Jeffes’ vision was perhaps then a yearning for classical, notes-on-parchment music to even just slightly flirt with the electronic advancement of music. In a track like the latter, his orchestra shows how a movement can interact and ultimately co-operate with the sort of industrial sound one would expect on a Brian Eno album. Still, the orchestra never loses sight of its goal. The way the piano in ‘Kora Kora’ speaks exclusively in glissando, the half-second echo of the string section in ‘Lifeboat (Lovers Rock)’, the way in which tracks like ‘Lie Back’ and ‘Discover America’ manage to have you envision the shores giving way to land as you begin seeing mountains and landmarks, people and cities all convey something. The listener admires from afar, caught up in the music like one would get caught up in a starry night sky – unable to be directly impacted, yet still coming away with a personal interpretation. It all concludes with the ending of the aforementioned ‘Passing Through’, where for its last ever request the Penguin Café Orchestra asks for you to concentrate on the sound of drops of water; no more, no less. Such a tranquil, almost undetectable sound, brought to the forefront for you to absorb and ruminate on. The reissue of this album – done by Erased Tapes – is a very welcome move. As all good reissues do, it brings from obscurity an album and a band worth re-examining and listening to over and over again. For those of you wanting something refreshing, or perhaps in particular something that is played marvellously straight, I would absolutely recommend Union Café as a pleasant soundtrack to these winter months we’re in. In other words, give it a try.